Bookkeeping Notes: I may get commissions made through links in this post. Shane Ward is writing on a rules-lite OSR hack called OLD SCHOOL TOADSTOOL HACK. And there is a new OSR podcast on the horizon: Fear of a Black Dragon is a production by the guys behind The Gauntlet. I became aware of them because of their Dungeon World podcast Discern Realities. They also put out the community zine Codex. I wrote a review about the current issue - Codex Neon. Here is a free "Tutorial" Dungeon for Old-School Play. It looks mighty interesting, and I can't wait to dig deeper into this. 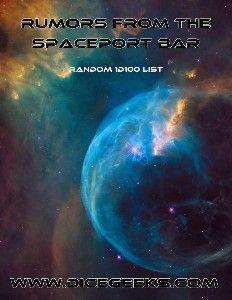 Rumors from the Spaceport Bar, PWYW. A random 1D100 list of rumors or possible jobs for a sci-fi setting. DayTrippers is set in a surrealistic near-future science-fiction multiverse, where an assortment of colorful character classes pilot unique machines into dream worlds and pocket universes to retrieve items of unearthly value and bring them back home. The system is a mixture of "traditional" and "narrative" roleplay with a uniquely simple action resolution system that creates exciting and unpredictable outcomes, and uses D6s only. 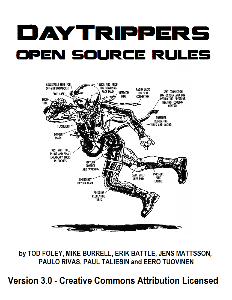 You can get the PWYW open source rules here (patreon) or here (DTRPG link). Trollbabe recently peaked my interest. Alex Yari played several solo sessions in 2016. The game was surprisingly dark. I liked the simple mechanisms (there is only one stat). Is Trollbabe the predecessor of Lasers & Feelings? Trollbabe is quite old (the second edition is from 2009). The mechanics of both games look similar. Unfortunately, Trollbabe's text lacks clarity. The examples contradict the rules. There is an insightful thread at story-games.com: [Trollbabe] (I did it...) My Way. It also drifts into a general game design discussion and offers an insightful look "under the hood" of this Story Now gem. Joe Banner works on his living document Dungeon World Lite. DW Lite is a concise mini RPG. It doesn't have the same old-school vibe as World of Dungeons but is similarly stripped down. There is a new article about Art of Rulings 12 – Hidden vs. Open Difficulty Numbers by Justin Alexander. The series is excellent but requires some time to read. And someone on Reddit posted this Imperium Romanum's GM's Guide for D&D. There is some overlap with the article mentioned above. However, you'll also find advice on encounter building, mysteries, wilderness adventures, etc. You might also like this Analysis of the 5 Room Dungeon Model. Teylen's Crowdfunding Collection #47. The only thing that catches my eye is Spire RPG because it's by Grant Howitt. I was impressed by his 200 Word RPG "Mechanical Oryx". But £15 - £22 for a PDF is too steep for my Kickstarter budget. Here is Tina's Weekly Indie RPG & Storygame Review Week 29, 2017. Check out the new Lasers & Feelings hacks. There is a Humble RPG Bundle for Doctor Who. $1 for the starter kit, $8 gets you some more sourcebooks and $15 for the whole enchilada. It seems like a good deal. I switched to Writebox for penning my blog posts. I mostly work on my Chromebook. I was looking for a simple in-browser solution with Markdown, Google Drive integration, Grammarly and Writefull support, and full page view. For a while, I worked with Minimalist Markdown. That one is neat if you want a lightweight Chrome Extension. But the online web version doesn't have GDrive compatibility. Stackedit doesn't work reliably (for whatever reasons). Dillinger doesn't render images if you use HTML instead of Markdown.